I was lucky enough to be among the preview guests and since I will not officially be reviewing this restaurant, I and my husband, Bill, were excited to give it a go. Herewith my report. 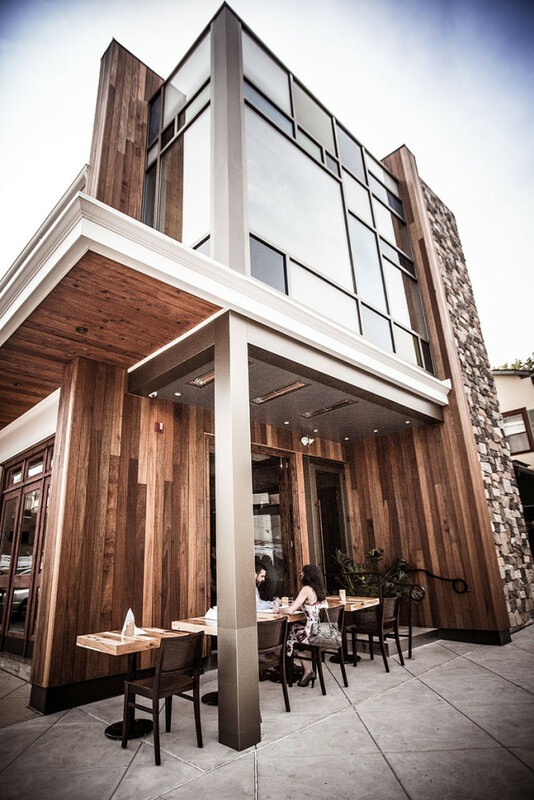 GUESTS ENTER via a dedicated door on Witherspoon Street and come upon a podium and hostess, technically located inside Mistral Bar. Guests are whisked upstairs via elevator. When the doors open, the first sensation is the wonderful scent of wood smoke, from the open kitchen’s open hearth. THE DINING ROOM is reminiscent of, yet different from, the original restaurant. Earth tones of gray and beige, the same oversize painting (not shown), the tables and chairs – all are reprised. As you can see, the kitchen is visible from the dining area. Happily, the cooking heat is contained and the cooks work virtually soundlessly. The room is softened with gray, subtly patterned carpeting, with slate covering the floor directly in front of the open kitchen and down a hallway that leads to restrooms and to two private dining rooms. The dining room features a vaulted, peaked ceiling that’s crisscrossed by roughhewn wood trusses and beams, all beautifully lit. 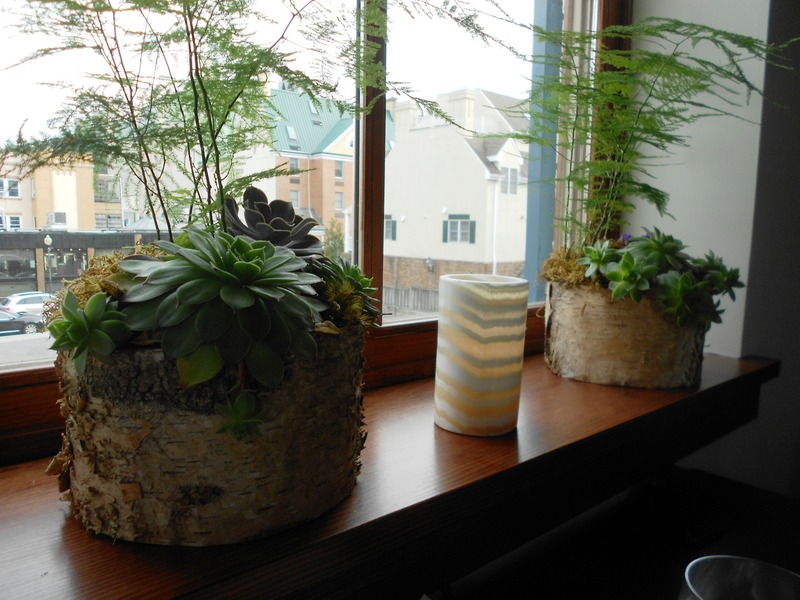 Greenscapes of succulents and moss dot the room, while luminescent marble candle holders add to the ambiance after dark. 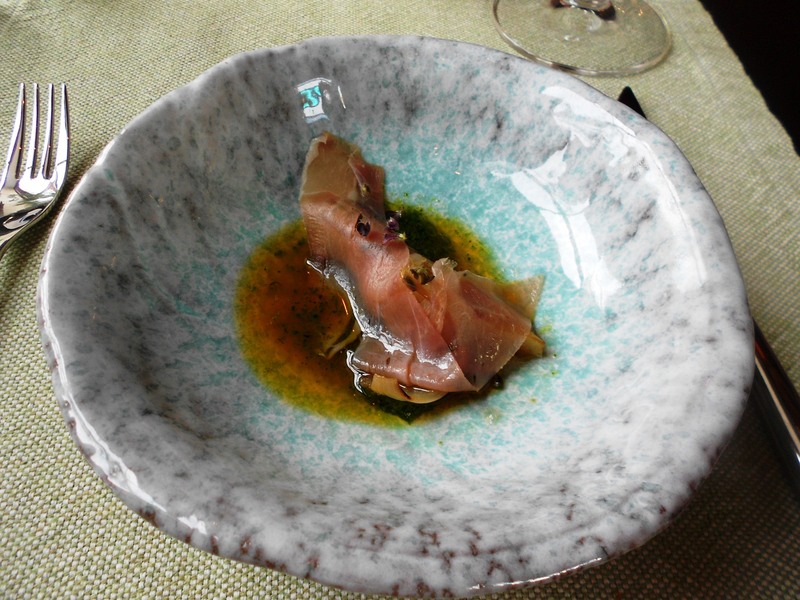 The 12-DISH CHEF’S TASTING MENU started off with 3 amuses. Above is the first one, shown alongside my choice of cocktail: a shrub featuring oloroso sherry. 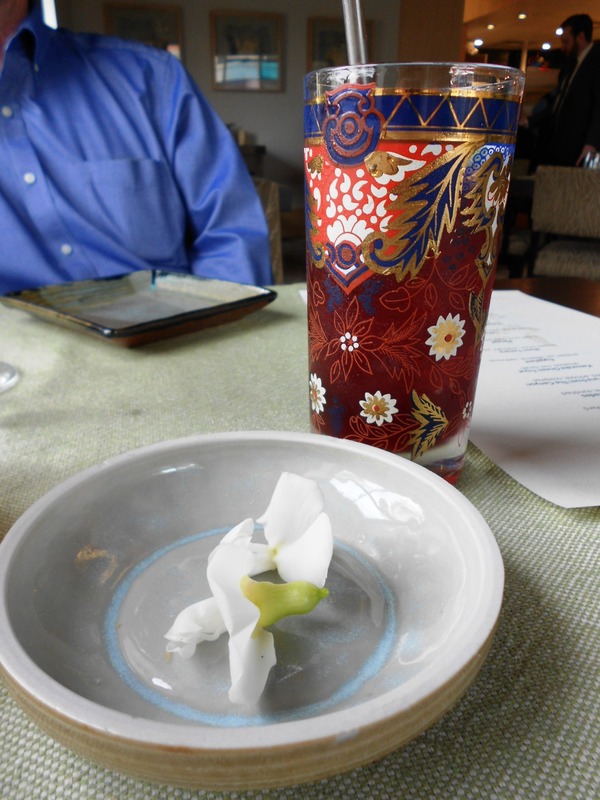 The unadulterated flower tasted of fresh, early-spring bean plucked right off the vine. Its bright, refreshing flavor put Bill in mind of uncooked sugar snap peas. The blossoms were presented on the first of what would be an amazing array of earthenware plates and bowls by potter John Shedd of Rocky Hill. 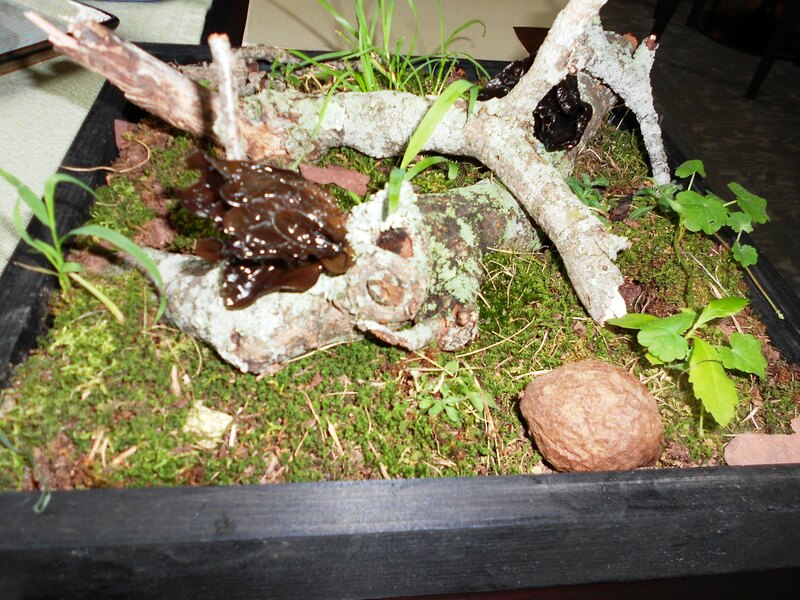 For the Wood Ear Mushroom amuse, a forest setting in a box held 1 glistening, pleasantly gelatinous, umami-packed mushroom per person. I’m told my eyes became saucers when I popped mine into my mouth – so much unexpected flavor! This held all the ingredients of the namesake sandwich in one big bite. Instead of bread, the genius vehicle is a single crisp-fried, light-as-air oregano leaf. I personally didn’t know oregano leaves could grow to that size, but was told these come from David Zaback’s Z Food Farm in Lawrenceville. This Cuban is light as air, and the oregano flavor is subtle, not overpowering. 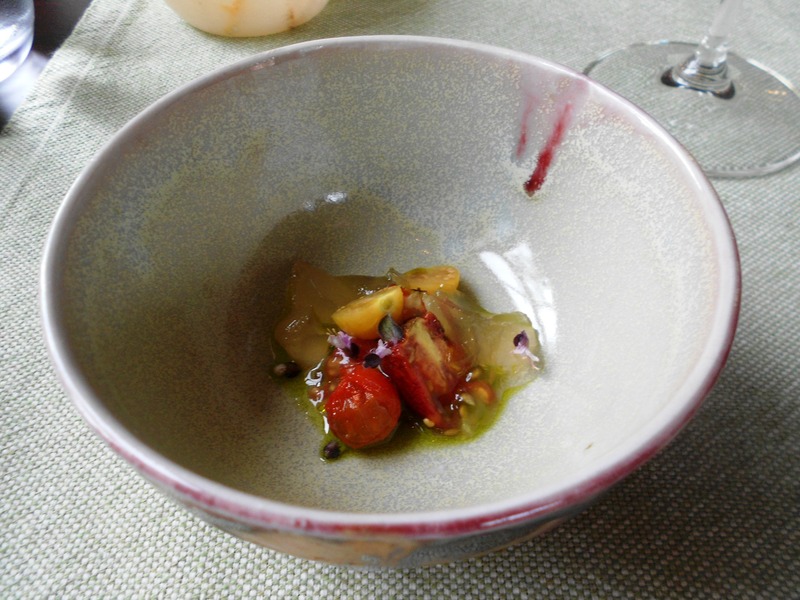 The salad course consisted of this bowl labeled on the menu as Roasted, Raw, and Sundried Night Shades – aka tomatoes. They’re lush and luscious, but what elevates the dish are cubes of what I termed jellied smoke (or what in the old days would have been called aspic). Two seafood dishes were up next. For this first one, Scott Anderson caught the fish himself the week before, while fishing in the Hudson Canyon off the Jersey Coast. Since it weighed in at 240 pounds (! ), he needed help reeling it in. Accompanying the pristine fish is a puree of charred false-alarm jalapenos (all the flavor, little of the heat), achiote, and the smallest, creamiest cowpeas I’ve ever encountered. 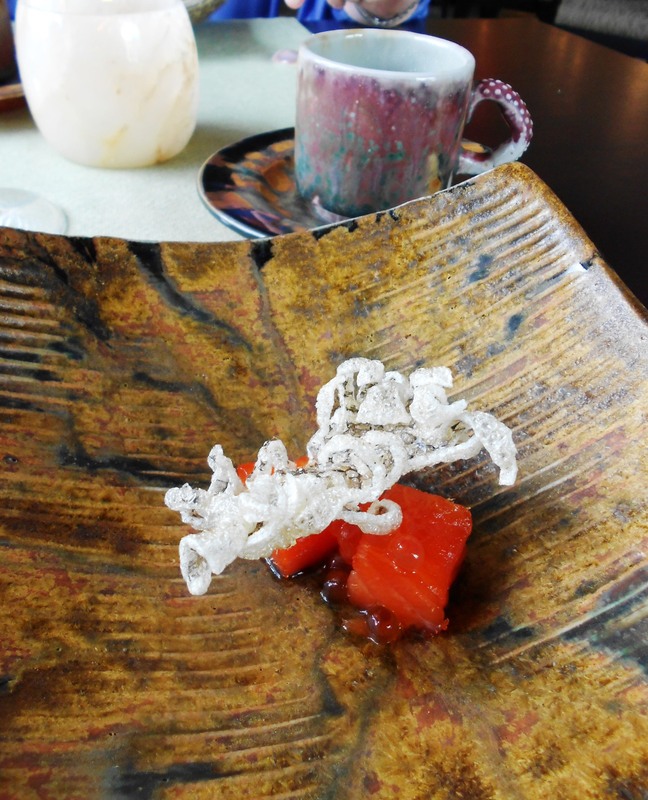 “Kasuzuke Ocean Trout: Smoked, Roe, Broth” – thus reads the menu. Smoky broth was poured into the thick-walled cup and saucer (note the jaunty squid- or octopus-like handle) that had been heated, and which retained the heat nicely. 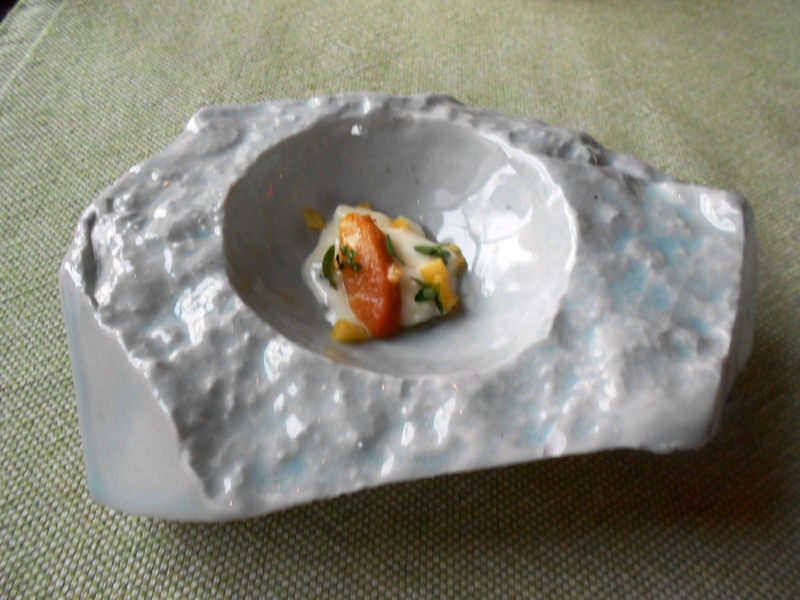 The frilly white piece is crunchy fried trout skin. 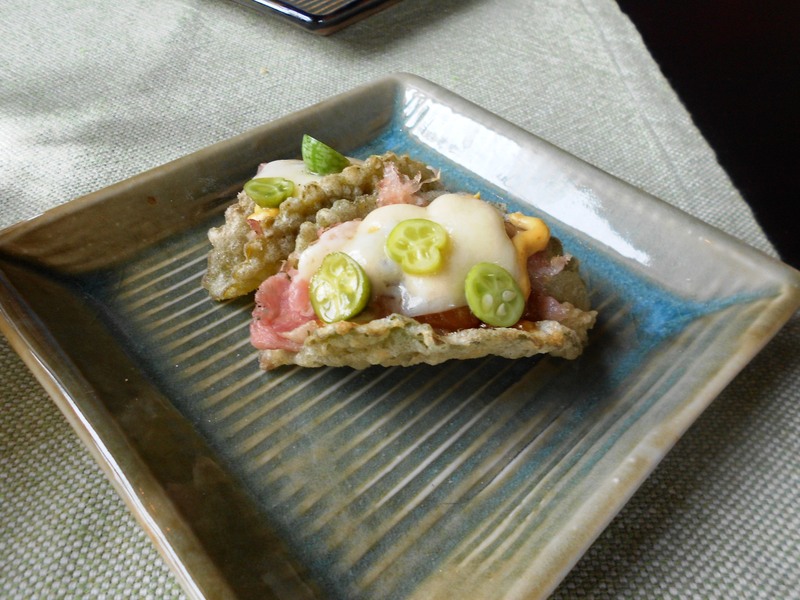 We were told that kasuzuke refers to the Japanese method of pickling and fermenting fish (or vegetables) in sake. A NOTE ON SERVICE: As each dish is set on the table, the cook who made it provides a short, clipped explanation with no fanfare. If you ask for details, they are provided. A NOTE ON WINES: Carl Rohrbach is Elements’ wine director. We started off with a style of wine new to me: Corail, a blend of three red grapes and two whites. (This one was from the Jura, Chateau D’Arlay.) Neither red nor white nor traditional rose, its unique color and taste went nicely with all of the preceding dishes. 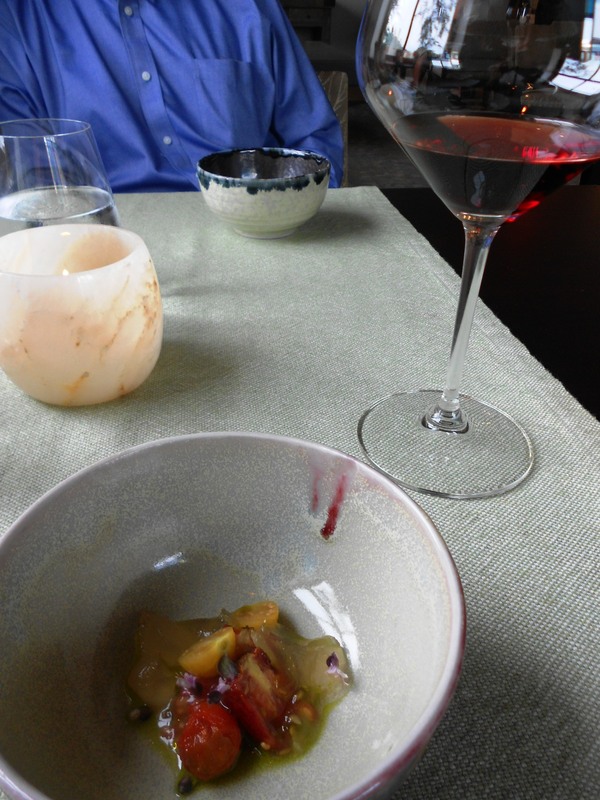 Starting with the eggplant dish, below, we switched over to a bone-dry Austrian Riesling from J.B. Becker. The wine list is interesting and surprisingly extensive. Each category has at least one moderately priced bottle (i.e. $42 to $65), and heads upwards from there. Our final wine, once we moved on to meat dishes, was a tasty Carema Nebbiolo (2009; bottled in 2014). So if the folks at Elements ever do retail, I’ll be first in line for any bottled broth, jus, or pistou. 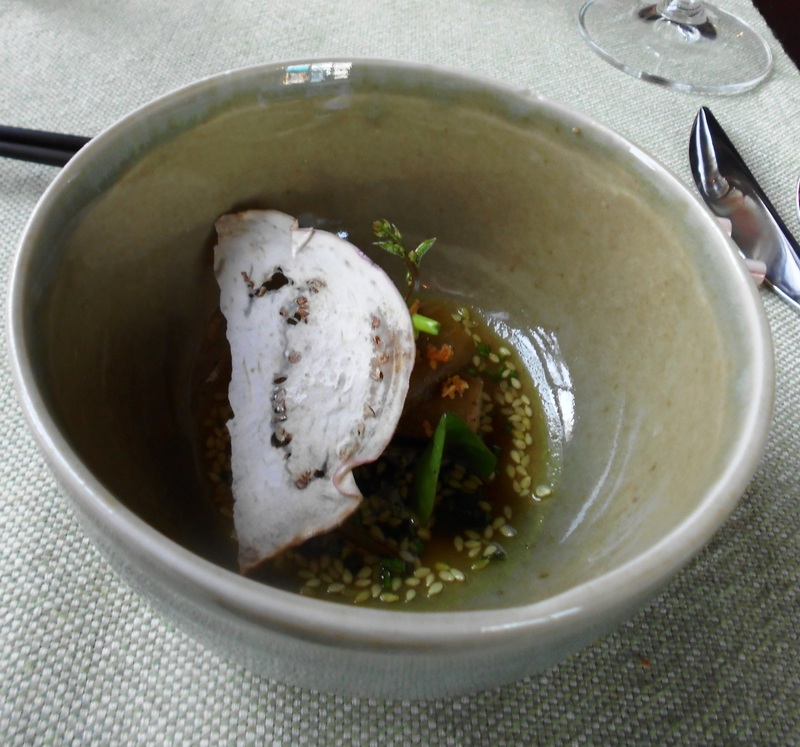 The chicken jus in this dish plumbed depths I didn’t know existed, helped along by nutty sesame and vadouvan. And you can’t even see the world’s tiniest Malabar spinach leaves. 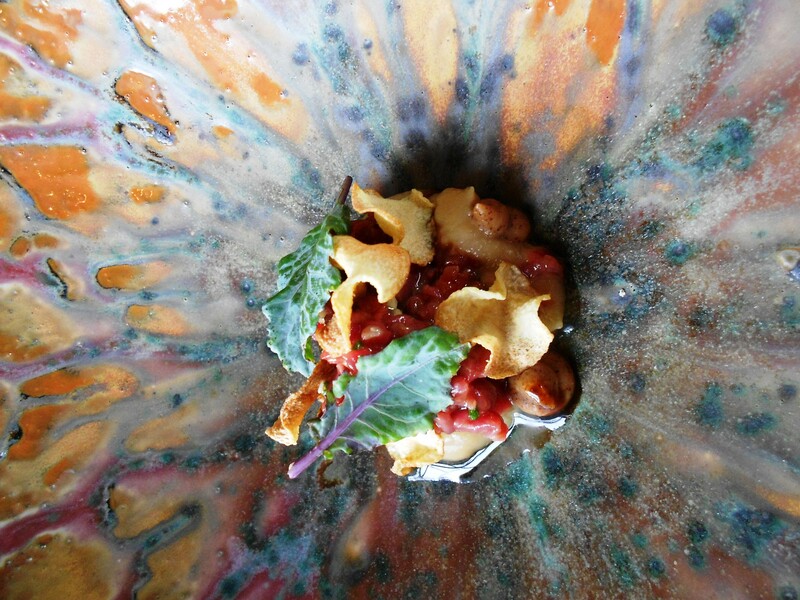 The star – eggplant – came in two forms: a crisp, thin chip and a tender, meaty “log.” Immensely satisfying. Admittedly, the 2 photos above are likely to be the best food shots I’ll ever take. But the super-gorgeous bowl holds our favorite dish of the evening: rich, silky bison tartare with tender, sweet Tropea onion, 2 forms of kohlrabi (chip and teensy leaf), and an underpinning of cream-colored jujube puree, which to me tasted like a cross between apple and quince. A NOTE ON PORTION SIZE: This dish is so rich that a small taste (as above) suffices. 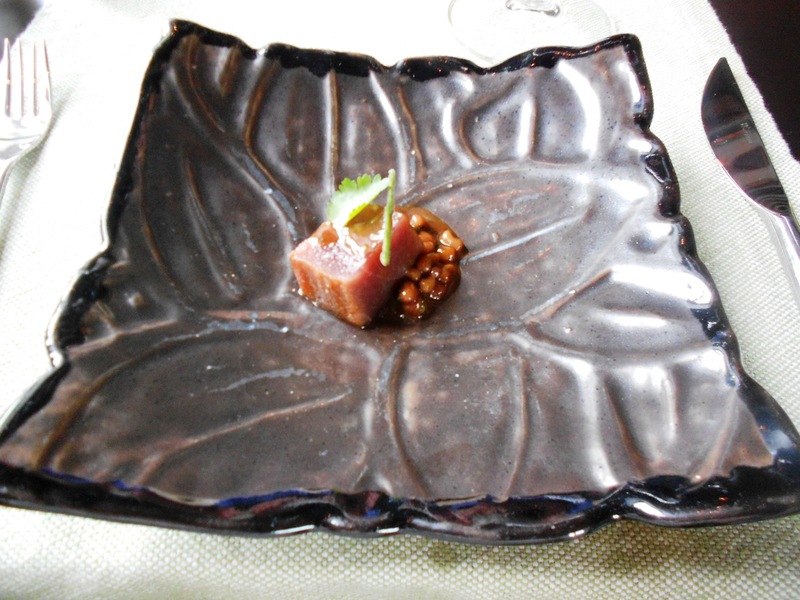 Other dishes in the 12-course tasting menu were so abundant in complex flavors and interesting textures that small is sufficient. This is one of very few tasting menus of this length that I have come away from without feeling overly stuffed or having palate fatigue. 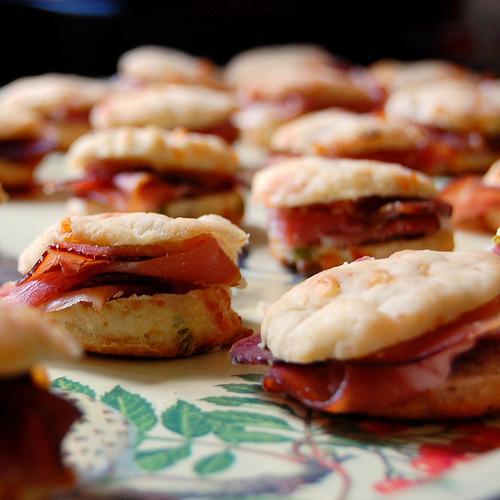 The house-made prosciutto was two years in the making, Anderson told us. Simultaneously delicate and full-flavored, it was wrapped around stalks of small fennel stewed to the point of melting in kale pistou. OK, so maybe by this point I had enjoyed too much nebbiolo. I have no other explanation for why this photo is so fuzzy. 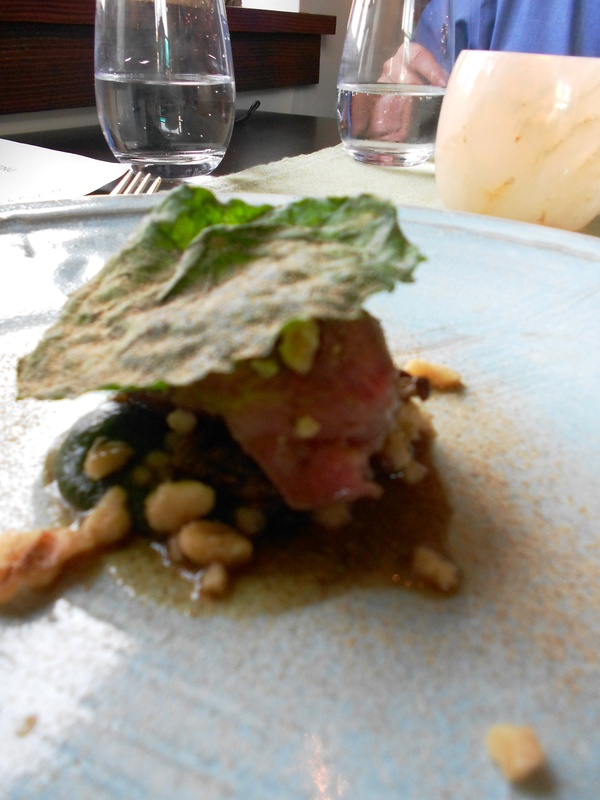 But I distinctly recall enjoying the rich meat, the tiny nubs of nutty buckwheat, the deep green puree (is that where the menu’s mention of miso came in? 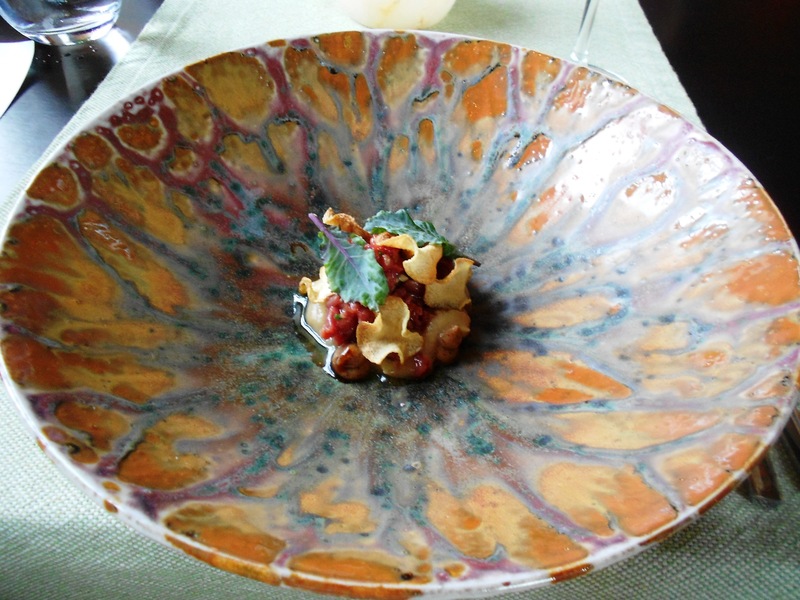 ), the finely chopped walnut, the piece of tiny brown enoki, and the peppery fried nasturtium lid. 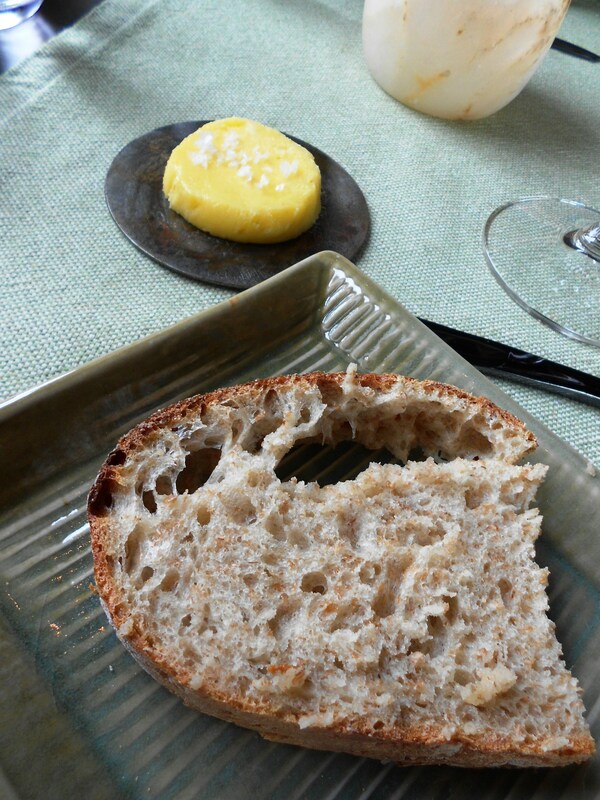 I nominate this Kittatiny Goat Cheese dish to replace all heavy-handed cheese courses on menus everywhere. The rich, creamy cheese (from Cranberry Creek Farm in PA) was sweetened by tiny bits of stewed peach, a touch of honey, and basil. The rich, soft dark-chocolate shell seemed to have a wonderful hint black pepper, although I could be mistaken. If you look really hard, you’ll see the almost microscopic anise hyssop blossoms. 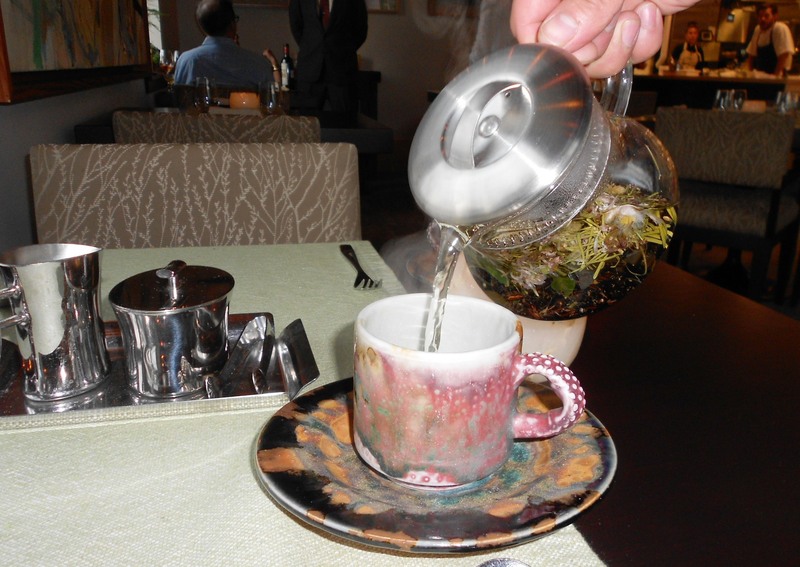 While my husband opted for a rich pour-over of Costa Rica decaf, I couldn’t resist this so-called Wild Tea, with its balsam fir, clover, fleabane, firewood (whatever that is), and rice. Fia Berisha, Elements’ new GM, insisted I let the second round of tea steep for a long time, to experience how the flavors changed/developed over time. The graininess of rice was forward in the initial pouring, while the balsam came forward for the second. 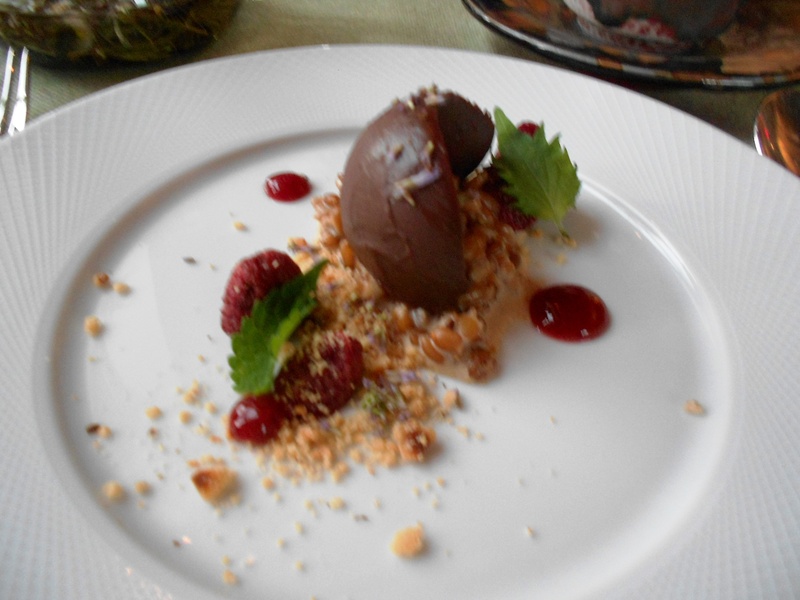 The final taste of the evening was a confection called Mountain Mint. My husband called it the best Peppermint Pattie ever. In sum, the newly reconstituted Elements is off to a fine start. 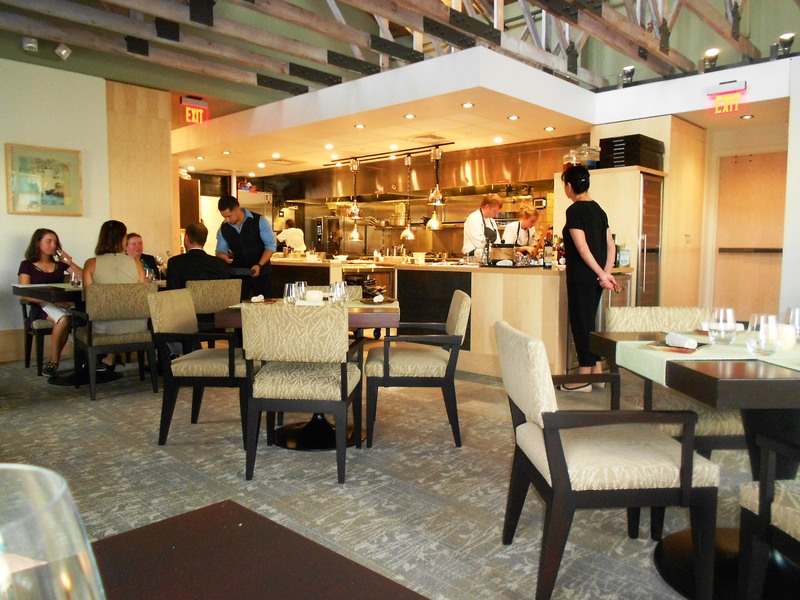 To view the opening menus – which include a weeknight four-course prix fixe – visit elementsprinceton.com. This entry was posted in Restaurants and tagged elements princeton, Fia Berisha, Mike Ryan, Scott Anderson. Bookmark the permalink.